Well this morning, when I woke Tiriki up, I found HIS very first seminal plug! What a pleasant surprise, now I don't have to wait for egg-laying to begin! That might explain all the ODD BEHAVIOUR lately! I'm guessing he is about 8-9 months, instead of the original guess of 6. HE"S growing up fast! I'll post some recent pics later. If he's old enough to leave a seminal plug, his age is at least 18 months. Well! Congratulations!! That's unusual for an ig so young. Sexual maturity is something more for no less than around a year and a 1/2 old. is the sexualmaturity level for a female ig the same. 18 months. my igs about a year and i would say 4-5 months old. is it possible for her to just "skip" this breeding season and act as if it were a normal time of year and than start showing signs next breeding season?! For a female it depends more on the size rather than the age. 10" svl marks sexual maturity and the size they are capable of carrying eggs safely. Female igs do not always become gravid. Some igs become gravid faithfully every year...some will double-clutch...some become gravid and they re-absord the eggs..often the human doesn't relaize they were even gravid. Your female is still young. She will be old enough by spring to become gravid. The age is just a generalization...some come in earlier...some later...but only by a couple of months at most. It's mainly the size for better accuracy. Thanks for the better guesstimate on age! I measured him this morning and we have 7"SVL and 27" SVTL. 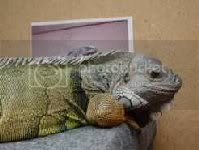 You know the they had a little male at the reptile shelter who's not much older than Tiki and he was just starting to "come in to his own" too! It was pretty funny to watch such a small iguana trying to impress the older females who pretty much just ignored him! You really think 18 months old, at the size he is? Maybe I'm just not wanting my "baby" to grow up soo fast! Check Photo Gallery, I'll post some new pics in a min..
Well, he's definitely long enough SVL to be a sexually mature male. Males are capable of this at about 6" SVL, as opposed to the 10" for the female that V mentioned. 27" STL is a pretty good length for an 18-month-old. I agree with IK. Definitely the right size for sexual maturity AND being at least 1 1/2 yrs. old.